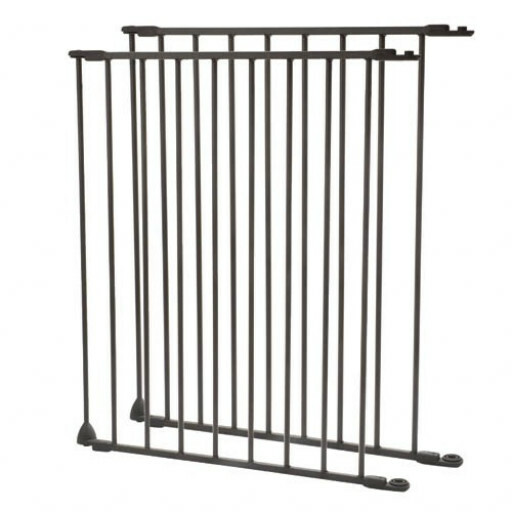 At The Fireplace Warehouse we are pleased to offer the sturdy and secure Stovax hearth grate additions. These are a pair of extensions designed to complement the Stovax hearth gate, which is sold separately. The Stovax hearth gate is designed to fit hearths measuring up to 70" by 24." The extensions add another 24" to each side. Functionality and ease of use are upper mind in the design of the Stovax hearth gate. This structure can be set up straight or set at an angle. Either way, the design not only adds safety to the fireplace setting, but also adds elegance to any room décor. Furthermore, the Stovax hearth gate is moveable. For those homes that may contain more than one room featuring a hearth, the gate can be relocated from one room to another quite easily. The ratchet-style joints incorporated in the design allow one to remove the gate from the wall brackets in seconds. When not in use, the gate and extensions fold flat for convenient storage. The Stovax hearth gate with additional extensions provides the security you are looking for to surround your fireplace, protecting your young ones and your pets. Yet, the functional design also includes a walk-through gate to allow for easy access to the fireplace. Made of the highest quality materials, this product is built to last.